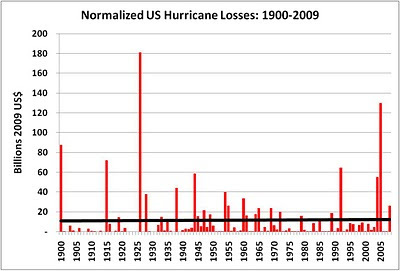 The figure above shows normalized US hurricane losses for 1900 to 2009. It shows an estimate of what hurricane damages would be if each hurricane season took place in 2009. The dark line shows the linear best fit from Excel. Obviously, there is no trend. 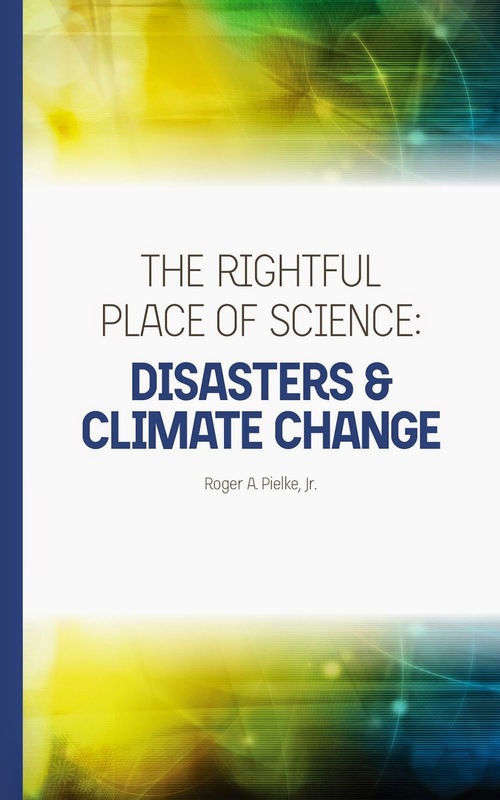 This makes sense as there has also been no trend in U.S. landfall frequencies or intensities over this period (in fact, depending on start date there is evidence for a slight but statistically significant decline, source in PDF). One indication that our methodology does a good job adjusting for societal change is that the resulting time series matches up with the time series in landfall frequencies and intensities. If there were a significant bias in our methods (for whatever reason) it would show up as a deviation between the normalized trends and the geophysical trends. We see no such deviation. Other reasons for confidence in our analysis is that it has been independently replicated on several occasions and that we (and others) can also recover an ENSO signal in the data (e.g., PDF). Pielke, Jr., R. A., Gratz, J., Landsea, C. W., Collins, D., Saunders, M., and Musulin, R., 2008. Normalized Hurricane Damages in the United States: 1900-2005. Natural Hazards Review, Volume 9, Issue 1, pp. 29-42.